A Boeing 737-200 had to abort a landing after heavily damaging its right wing. 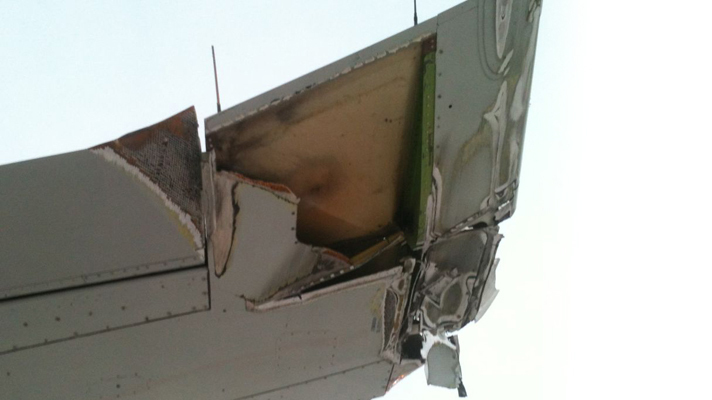 The impact was so harsh that it ripped off part of the wing and damaged a flap. The plane recovered at the last second, when it seemed that a fatal impact was imminent. The fog was about to arrive, but it descended very quickly. The pilot saw the runway and the only thing he had to do was to go by the inside [of the runway] because the fog was coming from the other side. He had to perform a go around and he was doing that when the fog combined with the sun and everything turned white. Needless to say, this doesn't make any sense whatsoever. Especially when the video shows no fog on the runway and the reported visibility was 19,685 feet (6,000 meters) at the time of the approach. After the aborted landing, the pilot performed a go around and decided to finally head to Copiapó — Chamonate airport, where it landed without further incidents. Thank the flying spaghetti monster for that.